I have not tested this pattern so please email me if you find an error. THIS PATTERN IS MADE FOR A 28 OZ. DAWN DISHWASHING DETERGENT BOTTLE. OTHER MATERIALS: 2 wiggle eyes, empty dawn bottle, small rosette flowers, yarn needle. Stitches used: ch, sl st, sc, sc dec, hdc, dc. ROW 1: Ch 18, sc in 2nd ch from hk and in each ch across (17 sc). Ch 3, turn. ROW 2: Dc in each of next 7 sc. (dc, ch 1, dc) in next sc. Dc in each of next 8 sc. Ch 3, turn. ROW 3: Dc in same st as beg ch 3. 2 dc in each of next 8 sts. (dc, ch 1, dc) in next ch 1 sp. 2 dc in each of next 9 sts. Join with sl st to opposite end of Row 3. Ch 3 and begin working in rounds. RND 1: Dc in each of next 8 sts. (dc, ch 1, dc) in next st. Dc in each of next 9 sts. (dc, ch 2, dc) in next ch 1 sp. Dc in each of next 9 sts. (dc, ch 1, dc) in next st. dc in each of last 9 sts. Join with sl st in top of beg ch 3. Ch 1, Do not turn. RND 2: Working in bl only, sc in each st around. Join with sl st in beg ch 1. Ch 1, Do not turn. RND 3: Rep Rnd 2. RND 4: Rep Rnd 2 but work in both lps and Ch 4 at the end, Do not turn. RND 5: * Sk next st, dc in next st, ch 1. Repeat from * around. Join with sl st in 3rd ch of beg ch 4. Ch 1, Do not turn. RND 6: Sc in each ch 1 sp and in each st around. Join with sl st in beg ch 1. Ch 1, Do not turn. RND 7: Sc in same st as beg ch 1. *Sc dec over next 2 sts. Sc in next st. Repeat from * around. Join with sl st to join rnd. Ch 3, Do not turn. RND 8: Dc in bl only of each st around. Join with sl st in top of beg ch 3. Ch 3, Do not turn. RNDS 9-12: Dc in each st. Join with sl st in top of beg ch 3. Ch 3, Do not turn. RND 13: Dc in same st as beg ch 3. 2 dc in bl only of each rem st on prev row. Join with sl st in top of beg ch 3. Ch 3, Do not turn. RND 14: Dc in each dc around. Join with sl st in top of beg ch 3. Ch 3, Do not turn. RND 15: *Sc in next st, Ch 3. Rep from * around. Join with sl st at bottom of beg ch 3. BODICE RUFFLE: Attach yarn to any unworked lp of rnd 2 while holding dress with neck toward you. Repeat Rnd 15 and fasten off. Step 1: Attach yarn in any unworked lp on Rnd 13, Ch 3, dc in same lp. 2 dc in each rem lp around. Join with sl st in top of beg ch 3. Ch 3. Do not turn. Step 2: Repeat RND 15. Fasten off. STEP 10: Repeat Step 9 to marker. Sl st in last st and fasten off leaving a 6-8 strand to be used later to attach head to bottle. TO ATTACH HEAD TO BOTTLE: Weave the 6-8" strand of yarn you left on Step 10 in and out through the stitches around the neck. Stuff the head with polyfil. Position the head over the lid of the dawn bottle and pull the string to draw the neck tight just under the lid. Tie a knot and weave in the end a bit before trimming. Ch 20, hdc in 2nd ch from hk. 2 hdc in each rem ch. This makes the arms curly. 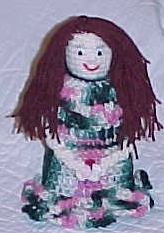 Attach the arms to each side of the doll. Fasten the hands together and glue on rosettes. Glue wiggle eyes on. Stitch eye lashes on with black thread. Use the same color yarn you made the head with and satin stitch on a nose. (refer to picture) Glue on a red piece of chenille for the mouth.